Support our #PlantYourDreamBlog Campaigns* including Breathing Renewed Life into our medical model through reconnecting with nature. My back muscles still feel reactive but the healing of my back after surgery is in good shape, verified as of aug. 13, 2018. I was in the hospital 12 days. Surgery was may 1. Noticed some sprinkling of raindrops that day. These are some of my primary #PlantYourDreamBlogs on my natural #Rekindling of Faith Journey. OHI, Optimum Health Institute Journal. Support our #PlantYourDreamBlog Campaigns including Breathing Renewed Life into our medical model through reconnecting with our nature. What do I need for my body to heal now? I’m exploring this question deeply this morning July 1, 2018. I’m going deep with the help of Adrienne Prince to feel into the various possibilities. I’ve been following a natural cancer cure since August of last year. We’ve tried many natural protocols, many of which we still use. We have been saddened and shocked that we cannot show better results, and we are slowing down today to remind ourselves of our healing journey these past three months. Following my last appointment with my UCSD surgery team, Monday, June 18, I consented to take a CT Scan with contrast, to more fully see how to do the kidney surgery now. The CT occurred on I was willing to have the kidney surgery to remove the tumor that continued to grow. The surgeon needed to see better pictures before he could know enough to perform the surgery. After the CT Scan he called to tell me that there were other areas of concern in my body, including small potential growths in the lung and pancreas, and a thickening of the Bowel wall. The UCSD Team now wanted a lung biopsy, a brain mri, and a Bowel scoping to determine if cancer had spread. The treatment plan said surgery on the kidney was not recommended at this time. I went ahead to schedule a consultation for the link tissue biopsy for Monday July 2, but this morning I am looking at slowing down and again reconfiguring. This news about the CT scan of Thursday June 21, came on Saturday morning. June 23. At that time I had already been passing urine with blood for 10 days. The bleeding began Friday the 15th, the day after my last MRI. The bleeding has been happening sporadically for the last year, usually in response to emotional stress or shaking things up in my routine. Adrienne had left for a visit to Pasadena that morning. Again, The request for a CT Scan with contrast came as an exploration for potential surgery on the kidney where the tumor was still growing. I want to be on good terms with my UCSD healing team. I could not ask for better Western medicine heartfelt support in my healing process. I have made the most of my every opportunity to be a positive influence during my whirlwind of healing focus that has entailed many MD doctor’s visits and consultations with members of my team in the wider integrative healing community including DO’s, ND’s, skilled acupuncturists, and other healers. Am I taking my life into my own hands, as I again explore another direction for healing approach? My body has endured great pain in the three months since my car accident, March 29. I had 3 weeks of excruciating back pain as I was walking with a broken back but did not know it. A fracture in my vertebra was not seen on preliminary X-rays March 29. On my first ortho visit April 25, the ortho doctor called me the luckiest man shed ever met. She said that I was lucky because if I’d made one wrong move, I might have been paralyzed for life. I was immediately admitted to Thornton Hospital and kept in bed until a surgery occurred 5 days later. I was in the hospital another 7 days. A new world of opiates and pain killers opened to me. I could not manage the pain with any of the natural remedies. May 1, was surgery. The day I stopped taking Oxycodine, an opioid , was May 28. Immediately I began feeling intense pain in my right foot. I could hardly sleep at all and tried to explore every conceivable remedy to quell the pain, eventually determined to be neuropathy. The pain was so bad that we went to the ER, where it was found that I did not have a fracture or sprain. My back was healing all this time but no one could determine the origins of this foot pain that was truly immense. In between the recovery from back surgery, I had bleeding in my urine flow, called hematuria, a symptom that accompanies Renal Cell Carcinoma from that Friday of June 15 until Wednesday, June 27. I was having constant heavy bleeding, and clots blocking the urinary tract. The pain was so intense, I took the oxycodone again in hopes to relax the sphincter. I was feeling increasingly weak from do much blood loss. Wednesday June 27 we visited the infusion center at UCSD and I received 2 pints of blood. We were directed to visit the ER, where they wanted us to wait another 4-6 hours (it was 11 pm already) and then get irrigated. I had just started a Chinese herb formula to stop the bleeding and I wanted to give it time to work so we went home instead. I knew we could return in the morning for quicker processing. The next day, June 28, I received calls from my oncologist’s nurse. They had thought I’d be admitted to the hospital after ER. They had wanted to monitor the bleeding more closer. On the phone, I told the nurse that I would go into the hospital if I could not stop the bleeding. While we were in the ER, as I was about to surrender to the bladder irrigation, I also received an auspicious text advising me of a specific food remedy and to not move forward with the biopsy. So what is the path I’m following now? I need time to get on the same page with my UCSD team as well as my other close team members and family. There’s an opportunity now to begin to transition to the program at Optimal Health Institute. They do Bowel cleansing there. It is a strict disciplined regimen. What are my choices now? I can either go forward with the biopsy of the lung or turn away from more invasive tests as I recommit to my natural healing path. I’m concerned that taking the recommended tests now will further commit me to a path of chemotherapy, radiation and other western medical interventions. I am not ready for further chemical approach now. I am most grateful for so many health practitioners supporting my healing process. I was considering taking out the kidney but at this time both the western medical team members and my inner guidance both concur that this is not the time for surgery. What is the next appropriate right action? I will be doing a lot of deep listening today and maintaining as best as possible, a joyful positive approach. Attempting to make sense of my next steps on my natural #cancercure journey that became more complicated March 29 when I was in a vehicle accident that made necessary a back surgery may 1 and a 12 day Hospital stay. Nothing I found in the natural realm could touch the pain levels. Turned out the first x rays that were interpreted as no fracture on March 29 were wrong. I was walking around with a broken vertebra but did not know it. At my first orthopedic appointment April 25, the physician in charge called me the luckiest man she had met. She said one wrong move during that three week period between the accident and April 25, the day I was admitted to the hospital with cracked spine, and I could have been crippled for life. I made the most of the 12-day Hospital stay. I kept my spirits high connecting with near everyone who entered my private room. Adrienne Prince, my partner and assistant was with me in the room. I wasn’t lonely. I felt I had purpose in introducing staff, nurses, and doctors to my #PlantYourDream ritual (that has applications to the hospital setting), and introducing @J R Organics CSA Farm organic strawberries & other giving away Hillcrest Farmers Market goodies. These gifts were highly appreciated. We set up the room with altars and nature objects and high intentions. Numbers of the staff commented on how good the room felt. Make our world a more beautiful place. I had three appointments at UC San Diego Health Monday June 18, two with the Oncology team and one with my back surgeon. I stopped taking an Opioid Oxycodone, May 28. The following day I began to feel increasingly severe pain in my right ankle. There were nights between May 28 and June 18, I could not sleep at all. The condition has been identified as nerve related, neuropathy. The condition does not appear related to the back surgery, according to my surgeon. My back is healing nicely. Does neuropathy want exercise or rest? My surgeon says exercise is good. More PT, massage, and acupuncture are up ahead. I am ok for hot springs. I am anxious for some kind of natural spring. What did the Oncology team report? The tumor is still there in my right kidney. It has grown on two dimensions, and appears to have shrunk on one dimension. After all the drugs and stress of the back surgery, I was concerned the identified RCC—Renal Cell Carcinoma—might have metastasized. It had not. It been a year since I was first identified with an abnormal growth. It recent days, following an MRI June 14, I started to bleed and I had blood clots blocking my urine flow. It was painful and frightening. Gratefully, the blood clots released on June 17. I lost lots of blood. Hematuria is an expression of RCC. In the last six weeks I have had numbers of IV Vitamin C infusions (with B12 and Glutathione) and colonics and no bleeding. Did the new dimensions of the tumor indicate any results from everything I have been doing naturally? Adrienne calculates an overall 10% shrinkage, but overall it has grown. Gratefully, my kidney function is in the normal range. Creatinine levels and GFR are both in great healthy range, showing great improvement from May of 2017. I have shown that shifts in diet can improve kidney function. The thought of undergoing another surgery now to cut out the tumor seems foreboding. I want to make progress with the ankle pain first. There appears to be no clear understanding of its cause. Will exercise, PT, and hot springs help? I need to reduce this pain now before I would undergo another hospital return visit. At least now, I am reassured I am I good hands at UC San Diego Health. I recommend this Hospital. I could not ask for a better healing team that has included an intro to Osteopathy, outstanding care at Pacific College of Oriental Medicine - San Diego; as well as in the hospital, acupuncture and Healing Touch and a visit from a service dog! Gratefully, a regimen of using cannabis for pain relief appears to be working. At least, I am able to sleep—some. and today, no bleeding. I have teceived value from Big Pharma drugs, and I am profoundly grateful for the role I am playing in underscoring how important Nature’s Original Technology continues to be! I am being encouraged to cut out the tumor that likely or perhaps may leave me with one kidney. I will continue my natural remedies. I will be in a back brace for four more weeks; however, the back surgeon says I am ok now for the tumor surgery. What is my body saying? I am weary from so much persistent pain. As I began writing today. I was not in touch with my sense of purpose and there are times I feel discouraged. Both Adrienne Prince and I are weary of our lives being focused on hospital and practitioner visits. I feel distracted from the things I want to do and would be doing now if I did not have these conditions. The EG Mobile, My 68 Vw is still in the shop being restored. For six years, my response to all the breakdowns in the world has been to focus my life energy on a yearly journey to NorCal in support of the #heirloomExpo. I call this #PlantYourDreamBlog Campaign The Enchanted Garden Mobile's Journey To Win Back Our Sacred Seeds. September 11,12,13, 2018 will be the The 8th annual National Heirloom Exposition, Santa Rosa, CA. I have a date in mind, if all goes well, to be co-promoting the #heirloomexpo and the Circus Vargas! That will be in NorCal the same time. Hundred of squash are grown for the #heirloomExpo. Last year, Adrienne Prince and I launched a #PetCekebritySquash project that raised an additional $1500 for their kids garden project. There has been challenges—physically and emotionally—to make the journey north every year, and this year is no different. What is the best use of my time now? I would like to invest more time in putting out A History Of Peace on Earth-#lesliegoldmanlegacywritings with Adrienne’s help. I would like to clear and catch up with systems of organization very close to home. I want to be grateful for so many lovely housemates who care about me. Many miles yet to go. Thanks ❤️ for your support. It has helped me ride through this adventure. that I am here now to help breathe new life into Modern Medicine, and what I am doing now—doing my best to heal—matters. Up out of bed, Goldman. Do your best to believe you can do it. Many others, some listed below in comments on fb. Working to pull my spirit up after a few difficult days. 15 days since my back break was refuses in surgery. 12 days in the hospital, and before this near a year attempting a natural #cancercure journey. The symptoms of persistent pain in the left kidney area has me questioning if the tumor in the right kidney has spread, especially with the addition of opioids and drugs after more than 40 years of natural healing miracles. Where is my #RekindlingOfFaithJourney now? Pain is an outrageous teacher. Grateful for excellent care at UCSD Jacobs Medical Center #thorntonpavillion but it concerns me that the Ortho Team and the oncology Team never got together with me as one integrated effort. And what do I do with the info that my original ER Visit showed no fracture of the spine. Then on April 25, the day of my first Ortho visit, CT Scans for cancer purposes showed an almost clear life threatening break that had the Ortho Team insisting I immediately get into the hospital to avoid a danger of paralysis if I moved the wrong way. For three weeks, before my first Ortho visit I could not get out of bed without intense screams and Adrienne Prince literally holding my back in place while I moved up and down from bed. 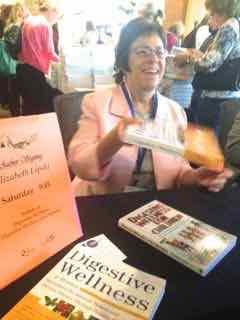 Hundreds of Facebook friends surrounded me with love, visits, and long distance healing. No natural substances would stop the agony, only the opioids have helped and the care and concern. The hospital stay, I meticulously recorded in photos and details. I can’t believe all the pain I have endured was just for my personal benefit. I am a writer by nature. My constant companion has been a snakelike gourd, representation of the Ancient Rod of Asclepius. With your continued support I will create a new edition of my book Rekindling of Faith Journey. 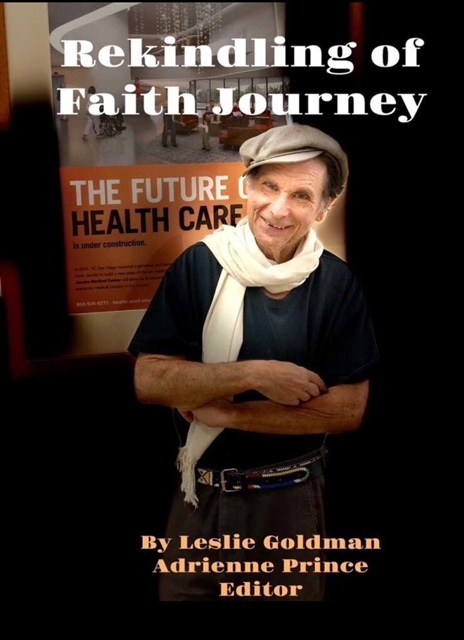 The book with tell my healing story. So what can I make of today? My back hurts. I an overdue for a pain pill. Leslie in the Hospital Setting. Wednesday, April 25, 2018-Tuesday, 2:00 pm, May 1, Surgery, Check Out, Monday, May 7, 2018. "Someone once told me that dreams were for children. Aren't we all children? Leslie's work connects people to envision fully, to embrace what's possible, and to walk forward in hope. He is inspiring and brings us back to what's essential, and what is uniquely essential. I would love to see him working in hospitals, schools and widely to plant seed of hope and dreams like Johnny Appleseed." --Liz Lipski. In the twilight of waking up, not really here or there, not fully knowing where I was, I imagined I was in a community of some kind where people like myself—called Patients—were thoroughly cared for with Excellent Care, and the Caretakers were thoroughly well cared for and Rewarded—Fairly. go on strike for better Wages and Needs. I will likely leave this residence called a Hospital. My stay has been very Hospitable. If this is the end of my life, or close to it, I have done the best job possible to fulfill my purpose as a writer. The pain is still here with me. I have delved deeply into this pain and wrote about every aspect of healing for more than 40 years. Here, take it. This writing is my legacy to you, to humanity. Likely, if at all possible, I will leave this place today. Once the pain in my spine leaves, I will give one more attempt to live a few more Chapters. A hospital bed will be my new bed at home. I will transition off this regimen of opiates, carrying out from this place my homegrown Rod of Asclepius— grown from a gourd that looks like a snake. What will the next months bring? I will accept in gratitude all I have received. Will there be another surgery following this for Renal Cell Carcinoma, or will we once again find that Nature Has a Remedy? For sure, I am thankful for the gift of so much life and pleasure. more than bricks and stone. There is always more to be said. Oxycodone every 3 hours today. telling us we have not lived fully. to the paradise of self-fulfillment. Self-fulfillment is the willingness to live in paradise. Pain confirms that life is intentional; purposeful. Life cannot be avoided, short circuited, or short-changed. We own life: its price is that we live. Pain suggests the necessity to live sacredly. to this responsibility, and to each detail. As we do, life delivers us joy. Life is us asking we be conscious of life. Support our #PlantYourDreamBlog Campaigns including Breathing Renewed Life into our medical model. Woke up with fresh inspiration and gratitude for all the support I received last evening, April 12, 2018 from my Fb Friends. I was doing a back to back CT scan on chest area as well as an MRI on pelvis and abdominal. My outstanding UC San Diego UC San Diego Moores Cancer Center Team is still “Fishing” around my other organs to see how the Renal Cell Carcinoma (Aug 7, 2018)—right kidney tumor—is behaving or misbehaving. Ever since, I have been on a Rekindling Of Faith Journey to re-establish my inherent relationship with Mother Earth’s #NaturesOriginalTechnology. Can I Heal from Cancer naturally, using recommended organic/biodynamic foods, Dr. Bernard Jensen/Ellen Tart Jensen Protocols, and Rob Wergin Heal Documentary Community Belief Systems? The drama for me April 12 was that on March 29, 2018, while switching lanes on one of our great @San Diego, CA Freeways, I was forced to immediately slow down to avoid completely stopped traffic while switching lanes. While doing this braking. 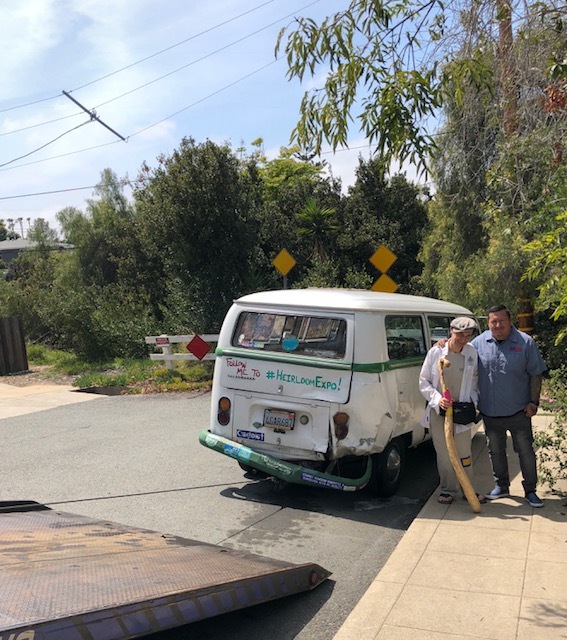 a truck/trailer unit could not stop and rear ended Our Summer of Love Conceived 68 VW The Enchanted Garden Mobile's Journey To Win Back Our Sacred Seeds. This Celebrated vehicle is now in the hands of “adopted” Bro Steven Moran of #AccidentPros. was overdue for a Makeover after six yearly trips from San Diego to Santa Rosa ( & the Frey Organic Winery Ranch)—where I annually retreat). She will, God Willing, be driving up for the The 8th annual National Heirloom Exposition, Santa Rosa, CA Sept 11-12-13, 2018 #HeirloomExpo & Her Return Organic Day at Circus Vargas Engagements with my Circus Vargas Family of Friends in the NorCal area. So what happened April 12. With a mid back injury potentially hitting 10 on a 1-10 pain scale, how did I get on the CT & MRI tables??? What Diet Recommendations was I following during the Aug 7, 2018-March 29, 2018 period that helped me go from a 3.26 High Creatinine level May 2017 to an outstandingly good .80, as tested in Jan 2018? How did the accident March 29 and the subsequent taking of Big Pharma Drugs effect my Creatinine and GFR, indicators of Kidney Function? Prayers & Good Thoughts. Waiting in ER. Thanks for all the responses. Much appreciated. Mike, my mechanic came out to look at my 68 VW Van known as The Enchanted Garden Mobile's Journey To Win Back Our Sacred Seeds. He has worked with insurance companies before. An appraiser will come out, likely Monday at the earliest. Advised by Mike to not attempt any fixes until appraiser comes. The damage is beyond what is called Totaled, however, Mike was able to drive it. We cannot open the engine compartment or the side Panel. body shop Accident Pros San Diego. He is a Miracle Worker and a friend. This will be a tremendous before and after job. I am lying in bed as usual when I write. My spine has basically been fused with @anglyosin spondylitis, a form of arthritis much of my adult life. I felt a vertebra in my mid back that does not move, move, from the force of the collision. came to the site of the accident. We got there at 6 pm and I had x-rays on my spine and chest. They is an intense pain in my back in one spot, radiating out ward when when I move. Nadine and Don left around midnight, six hours after I arrived at ER. Morea Garcia ( @the healing hands of Morea Garcia ) came to Er before Nadine and Don left. Morea drive me home and spent the night to help me in and out of bed. My assistant Adrienne Prince is expected in a couple hours. I am grateful I was able to sleep some. I am feeling headache and a strong pain in my mid back. The folks at the hospital gave me a topical muscle relaxer patch, however, I am still uncomfortable. I also took two AminoActiv, my anti-inflammatory of choice, rather than Tylenol or ibuprofen. Will check in with Pacific College of Oriental Medicine - San Diego as far as some muscle relaxants. I had plans to go to my annual @passover village retreat next Thursday. Let’s How the pain and healing in my back goes. Most grateful for all of you sending prayer and good thoughts. They helped me through what might have been a more severe ordeal yesterday March 29, 2018. It is now Friday March 30, 2018. First day of Passover begins tonight. Today is Good Friday. Today is April 13, 2018. I took 2.5 Hydrocodone pills yesterday during the day to get through morning errands and an evening of MRI & CT Scan at UCSD Thorton Hospital. The pain in my back, from being rear ended March 29, is severe at times. I tried my normal natural “go to” AminoActiv, @Boiron Arnica Montaña, Chinese Herbs, Ibuprofen (gave me rashes), Tylenol, and many herbal products, and pain patches. Nothing so far has relieved the pain that makes me think twice to get out of bed...or out of the house for now! Last night, April 12, 2018, coming home from the UCSD Thornton Hospital MRI & CT Scan, I hit a new level of pain. Every pothole became a bump in the road of life, sending me into off the chart spasms and outbursts of agony. Adrienne Prince, my partner and 24/7 aid the past ten days since my vehicle accident, agonized over the trip home. There was little choice but to hit one of the many cracks in our city pavement. My pain stimulated her pain. Gratefully one half Hydrocodone, a piece of a heart of Edible Cannabis, and a topical back rub of a heavy duty Cannabis oil herbal mix let me sleep. I am collecting lessons from wanting to make peace with this strange new ally—Hydrocodone. How will I manage my back pain that appears to be more painful now that before I started this Opiate? How will I wean myself and get to the other side of this back injury that has been taking my focus away from my natural #CancerCure Journey? How will I awaken from this? My #CancerCure Journey Is now my #RekindlinOfFaith journey. Pain management is my Number 1 concern now. Getting in and out of bed is an ordeal. Surrendered to taking a narcotic, hydrocodone. My main job now is stabilizing. The Chinese herbal formula for muscle relaxing that I was prescribed yesterday is not doing the job. I am disappointed. Wanting to make peace with having to take pharma drug after my vigilant commitment to a natural journey. Under normal circumstances, I would prepare to travel today to my annual Passover Village retreat in Joshua Tree. Part of me wants to attempt that journey, but first things first. Can I get beyond this pain? EG Mobile Being picked up and taken to Steve Moran's after he comes over today at 1. Adjuster came yesterday. Working with pain management. Very intense pain and dependent on Adrienne to get me in and out of bed. Hard to get up and down out of bed by myself. I’ve been in this position before. I was once in a trailer by myself at a place called Stinky Springs outside Brigham City, Utah. I feel I was there alone for weeks, then taken in by a mom who took me home. After that came a long wait for surgery. I could not walk or sit for nine months. Reflecting on the good people I met and those who reached out to get me walking again. I am so grateful I was able to be part of the Passover Village this year, April 6-7, 2018. Coming home, we detoured through Ontario where the Circus Vargas cheered me up. I set out to get to know the performers. Being/Feeling part of a Team has always pulled me up. Thinking of you. I am in gratitude I was able to do my Passover Village. It meant a lot to everyone that I was there. I was not sure I could make it. It did not spiral to others I could make it. Big pharma let me manage pain. Very deep lessons about needing help to get in and out of bed all last week, and finally finding a drug that would work. Attempting to wean off of ibuprofen now. My regular anti-inflammatory of choice does not appear strong enough to handle this pain level. MRI this week, and Eg mobile in shop now. My insurance is paying now for medical expenses and wrote a check for repairs. We Rented a car. Some weeks a friend will loan their car. We need to work toward you being around good people who will honor you as who you are and the goodness you bring and deserve. On the way home, Adrienne stopped at Circus Vargas. Very good to be building relations with performers who are so adept in their bodies.